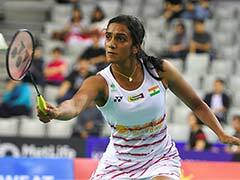 Former champions PV Sindhu and Kidambi Srikanth notched up commanding wins as 5 singles players and 4 doubles pairs from India entered the quarter-finals of the Yonex-Sunrise India Open 2019, an HSBC BWF World Tour Super 500 tournament here on Thursday. 2017 winner Sindhu never relinquished control to Hong Kong's World No. 37 Deng Joy Xuan in her 21-11, 21-13 win. Up next for the second seed is Danish eighth seed Mia Blichfeldt, who earlier ended the run of rising star Riya Mookerjee 21-8,17-21, 21-13. A day after needing three games for his first round win, 2015 men's singles champion Kidambi Srikanth did not put a foot wrong and recorded a 21-11, 21-16 victory over China's Lu Guangzu. Srikanth will next face Swiss Open runner-up Sai Praneeth in a blockbuster all-Indian quarter-final after Sai prevailed over fifth seed Sameer Verma. Earlier, in an enthralling all-Indian second round face-off, Sai Praneeth edged fifth seed Sameer Verma 18-21, 21-16, 21-15 to enter the quarter-finals of the India Open 2019, a BWF World Tour Super 500 tournament, here on Thursday. The marathon 18-21, 21-16, 21-15 win that took Praneeth 71 minutes to complete had the World No. 20 lying on the court in relief after converting the match point. This was Praneeth's second consecutive victory over the World No. 15, just a week after getting the better of him at the Swiss Open, where he made it to the final. Parupalli Kashyap made short work of world No. 58 Tanongsak Saensomboonsuk 21-11, 21-13 in just 37 minutes to secure his quarter-final berth. The former Commonwealth Games gold medallist ran away to 14-8 in the first game and continued the momentum in the second game to build an 11-3 lead. Subhankar Dey failed to repeat his first round heroics and succumbed to a 16-21, 13-21 defeat to world No.32 Wang Tzu Wei. Rising star Riya Mookerjee's brave run, however, came to an end at the hands of eighth seed Mia Blichfeldt 8-21, 21-17, 13-21. In mixed doubles, Pranaav Jerry Chopra and N. Sikki Reddy put up a courageous display before losing 21-19, 19-21, 14-21 to the fourth seeds Hafiz Faizal and Gloria Emanuelle Widjaja.